Short on Gluten....not on flavor! 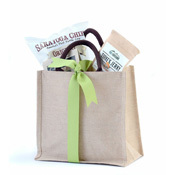 Our handsome jute tote is full of Gluten-Free snacks for healthy munching on the go! Saratoga Potato Chips are simply made, simply natural and simply delicious, and a generous 8 oz. bag of America's first kettle chip provides a satisfying, crunchy treat. The sweetness of orange and the zest of ginger blend with tender, all-natural turkey in Pure Provisions Orange Turkey Jerky. Loaded with protein, it provides a balanced, fulfilling snack. Inspired by an 1800's recipe, Castleton Crackers is known for its' artisanal, hand-cracked crackers, and this Gluten-Free version incorporates Vermont Farmstead Cheddar in a savory, crispy treat perfect for topping with hummus or olive tapenade. 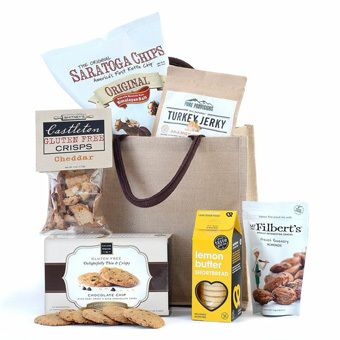 Everyone deserves a great tasting cookie, and the delightfully thin and crispy Chocolate Chip Cookies from The Salem Baking Company are baked with care using a blend of natural ingredients that fill every bite. 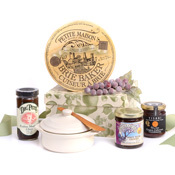 Delicate, melt-in-the-mouth buttery shortbread infused with the taste of sun-kissed Mediterranean lemons comes from the U.K.'s award-winning Kent & Fraser, artisan producers of award-winning Gluten -Free baked goods. And Mr. Filbert's hot-air roasted almonds, seasoned with French rosemary and a touch of sea salt, complete this guilt-free, gluten-free gift. Healthy snacking at its' best! Saratoga Chips- Sea Salt Potato Chips: The original potato chip, is crisp and crunchy cooked in a kettle. Castleton-Gluten Free Crisps:Gluten Free made with cheddar cheese, thick cut similar to bagel chip, but better!. Mr. Filbert's-Rosemary Almonds:Tasty hot air roasted almonds are tumbled with fresh French rosemary and a touch of sea salt, providing a crunchy, savory snack. Salem Baking Co-Gluten Free Chocolate Chip Cookies: Thin & Crispy Cookie baked with care using premium ingredients. Kent & Fraser-Lemon Butter Shortbread: A delicious duo of delicate shortbread make with creamy butter, sharp lemon juice and the added zing of freshly grated lemon zest. Cotton, Jute Mix Tote Bag, "12 x 12 x 7 3/4"